In recent times, more and more research has been done to prove that the air in your home can have a huge impact on your family’s overall health and well-being. There are more and more chemicals and synthetic materials being used in our homes, and with this, come many hazards which could be effecting your family’s health. Through advancements in science and technology, there are new testing methods and equipment being designed to help us to better test the indoor air quality in homes all over the Metro Atlanta region. A lot of homeowners want to know what our testing involves. Over 80% of tested homes have bad indoor air quality which could be negatively impacting the inhabitants – including pets! Have you or someone in your home had a constant sinus infection, chronic fatigue, coughing, or headaches? We’re not physicians, but much of the new research on mold indicates we are more susceptible to mold spores than previously thought. If you live in an urban area, such as the Metro Atlanta area, you know the frequency of the air quality alerts. Poor Air Quality: You sit with it in traffic, you exercise in it, you walk into the office with it; don’t let it follow you home. View our service area here, if you’re close, give us a call. We will take readings of the air from various areas in your home. We will then analyze the data and provide you with a report of what we’ve found in your home. If you have great indoor air quality, we want to be the first to tell you! This would be fantastic news. However, most of the time, we have to tell homeowners about the things they could be breathing in. We know that this can be scary, but we can also provide you with the necessary solutions to provide your home with much better indoor air quality. Particle Scanners were specifically developed for taking measurements in normal indoor environments. The device pulls air into it, and using laser technology, measures the particle concentrations in the air. The particles are measured by based on size, and each particle is individually counted. So why do particle sizes matter? Glad you asked! They matter because your body is designed to filter out particulates greater than 10 microns through normal breathing. You may cough and sneeze because these allergens are irritating your eyes, nose and throat, but your body is working to rid itself of these foreign particles. However, particulates smaller than 10 microns, especially those under 5 microns, are able to get past your natural defenses and damage your cardiovascular system. To create the optimum breathing environment, it is important to start by identifying the sizes of particulates are in your air. Our tools allow us to locate and isolate sources of particulate matter. Which provides you with the information you need to remediate them. When testing indoor air quality, the temperature and humidity are critical when determining the presences of molds and dust mites. Molds and dust mites are not air borne and cannot be abated through a filtration system. The only known method to rid your home of these allergens is through humidity control. 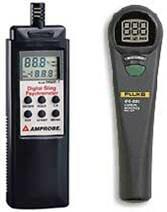 We use a variety of moisture meters to determine the moisture content of a variety of materials. If the humidity in an area of the home is elevated, and no reason is immediately evident, the moisture of the construction materials is measured. These measurements assist in identifying moisture sources in the home. Moisture can rise through concrete floors, come through concrete walls, hollow block foundations, and brick veneer. Unless severely compromised, these materials are not easily visually identifiable as excessively moist. Whether your home is less than 1 year old or over 100 years old, you most likely have an indoor air pollutant concentration higher than that outdoors. The more time spent in a polluted indoor environment increases the chances of developing respiratory problems. The very young, elderly, those suffering from allergies or asthma, and the immunocompromised are at greater risk. For a custom designed system to meet your home’s unique needs, contact Healthy Air USA, the right choice. We will provide you with a report containing recommendations to remediate the air in your home. We can help with mold remediation, dehumidification for excessive moisture in the air, and others.